Build better, build faster, reduce risk – and whatever you do – don’t make mistakes. Margins don’t allow for bad planning, lack of experience and minor brain hemorrhages leading to left-out parts of a project. Sounds like the construction industry you work in? Yeah, we know, but then… isn’t it about time to have a little less talk, and a lot more action? There’s a lot of talk about how to make the construction industry compete at a higher level. A lot of it is good talk too: Process optimization, better sourcing, educating the workforce. You know the drill. It’s all good – but here’s the thing: It’s mostly too much talk and not enough action, because it doesn’t lead to substantial and quantifiable differences. Fast. Steve Tobak at entrepreneur.com inspires us to do more than just talking. Steve rightly asserts that it is time for action. And the action in the construction industry is with the estimator. The global (and American) construction industry struggles to create more efficient and transparent processes in order to build better and faster – and of course – to make more money. Surprisingly, few people are aware of the crucial role of the construction cost estimator, when talking about this. But there is no doubt – the estimator holds the key to unlock more value in the construction cycle. The pre-construction phase, when the estimator gets his or her hands on a project, is the right time to optimize a project. In pre-construction you lay all the groundwork which delivers more flexibility, better margins and no mistakes. The decisions made by the estimator sets the pace and the standard for the rest of the project. 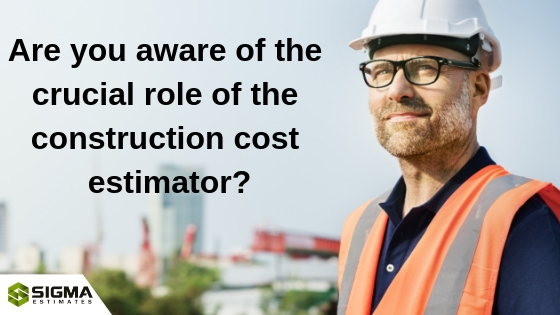 The real action in construction starts with the estimator. Accuracy is key. Sure. Pre-construction cost estimating is important to create a clear and accurate forecast of how much a construction project will cost – and therefore also inform, if the contractor should bid or not. Why bid on projects with no margin? But accuracy is not the end-all-do-all of estimating. In order to get a project off to a good start (and get the cost price right) the estimator also needs to know about the project in its entirety: Site logistics, lead times, materials and quantities, work activities, labor prices, rentals and equipment, local regulations, etc. Whoa! That’s a lot of knowledge right there. Experience to some, data to others – for us at Sigma: Just practical estimating. But what if you could use all of the above data – and share them with colleagues? If you have been working on Excel or other stand-alone tools for cost estimating, you must understand that these tools are unable to connect with subsequent process tools and involve a lot of tedious manual entry and re-entry of data, errors and broken formulas. These stand-alone tools are setting you up for inaccuracy in project management, sourcing and cost control – and therefore losses in the long-run. However, there are tools available that will not only make you faster but will also take the stress out of your life. Best-of-breed cost estimating tools like Sigma ensures complete transparency, more accuracy, and greater collaboration. Sigma provides an integrated, real-time view of project design, cost, and schedule. Unlike alternative solutions, Sigma is 100% adoptable and an easy-to-use tool for complex as well and simple forecasting. When using Sigma with other tools, through the open API and available App’s – you can do faster takeoff and better collaboration: It’s already integrated with tools like PlanSwift, Autodesk BIM 360 and Revit, as well as cost data from RS Means and BNI. Sigma is the perfect platform to start your construction technological journey. Still in doubt? Get started with your free demo. Are You Keeping Up with The Digitization in The Construction industry?